It has been decided. We’ve thrown it around for a long time. Dreamed about it. I’ve decided it is time. Mr. and Mrs. Fancy Pants will be writing a children’s book. We will be collaborating on the concept. I would imagine the writing will be an 80/20 split (myself being the 80%) and the illustration will be 100/0 (myself being the 100%). NOT. I consider myself a novice art director, but I’m working my way up the ranks. i’m nervous to give us a deadline on the concept since I have thought rather un-seriously about this for so long, however, if I toil over it for too long without getting anywhere, I’m going to have to slap a deadline on myself. I know nothing about writing books. But I do know good literature and I know a man with an eye for design. Certainly we can figure out the rest. –minus any semblance of organization or sense. I’m looking forward to it though. I’ve been looking forward to starting this project for so long. If we’re able to pull it off, it will be such a fusion of the two of our talents (emphasis on the word IF). I have nothing groundbreaking to share about the project other than it is. No working titles, no nailed down characters, protagonist, or theme. Just a drive to make a dream a reality. Keeping my fingers crossed from here until it’s completed! Decorating Ideas, Just call me Martha Stewart Jr. So I’m sure you’ve caught on by now that I am a genuine book nerd. Not to say I don’t love to socialize with real people outside of the written characters that I love to befriend, but there’s a certain charm about fictional characters that I sometimes miss in people. Naturally, I love bookshelves too, well just shelving in general. Mr. Fancy Pants and I have some great book shelves from IKEA in our apartment to store all of our fun things. I hope to someday fill it completely with books, but for now, I do what I can. I’m always on the search for new decorating ideas. Not that I’m going to start a complete decorating overhaul in our apartment any time soon but someday in the far off future, I would love to own our own home! When that day comes, I’m going to be ready! I have all sorts of ideas stored all over the place…now it’s just a matter of finding the funds to complete all of my dreams. Ha! Check out these awesome bookshelf ideas that I’ve been collecting. One day I will have shelves with a ladder! I think ever since I saw Beauty and the Beast as a little girl I've been enamored by ladders on wheels! Ok I know these aren’t bookshelves but they are shelving of sorts. For a lover of mason jars and organization…what could be better!? How awesome is this? This makes me want to eat only food from a garden or farmers market and store it all in mason jars. Not sure why but that’s the emotion it triggers! This picture actually reminds me of my friend Rachel. She is a fellow lover of all things vintage and loves mason jars. When we were in college we lived together for a year and I can’t even tell you what all uses she found for those little jars. It was truly a talent ladies and gents. I think this one is one of my favorites. How incredibly creative. If I had been told when we were getting married, “You can pick only one wedding gift, what will it be?” My answer would’ve easily been, “A SUNSHINE YELLOW KITCHEN AID MIXER!” (and yes, I would’ve answered an a voice that justifies the all caps). Hershey and Denise, dear friends of my parents’ from medical school, are the precious couple who gave us this amazing gift. 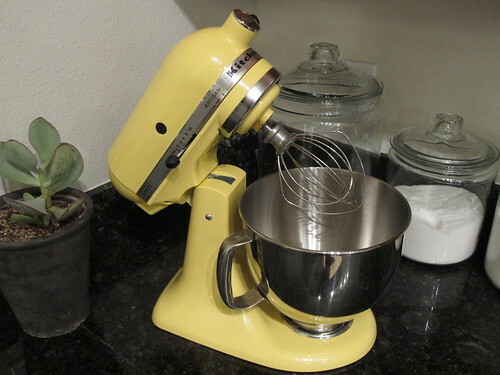 You can argue with me all day long but I am convinced that cooking is more fun for me because of this mixer. It is my favorite “kitchen gadget”. I just love the design of these. 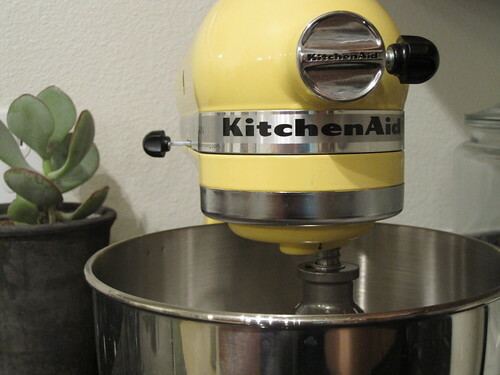 I would love it if Kitchen Aid would design a line of kitchen appliances inspired by vintage styles. I’d be first in line to buy Sunshine Yellow companions for my mixer. My reading obsession is no surprise by this point and time. Someone told me the other day that will all of the reading that I do I should invest in a Kindle. My dad, who is also an avid reader, got one from us for Christmas, however after giving this purchase a lot of careful consideration I have decided that I will not invest in one for myself. I like owning the actual books too much. As silly as it sounds, I like the look of them sitting on my shelves asking to be read and the feeling of turning the pages when I’m reading in bed at night. I’ll be that girl (I’m SURE joined by my friend April) if ever physical books are banned–you may be rolling your eyes and saying I’ve been reading too many progressive/futuristic stories, however you never know what people are going to come up with next–that will buy an old home that was used for the Underground Railroad or something and start stashing books away down there. I’ll never give up my books! My love for these cloth-bound Penguin Classics began a few months ago, a bit behind the curve may I add. These have apparently been available for a while and sadly I knew nothing about them until they were for sale at Anthropologie. I now have all but three of the original set (two of the ones I am missing were never for sale in the US and I am scouring ebay to get my hands on a copy) and I’m not ahead of the game for the newly released second set! I had an alert set up on Amazon to let me know if any more of these were published. Thank you Amazon for coming through for me. Seriously though, how beautiful are these? Madame Bovary, Great Expectations, Wuthering Heights, Sense and Sensibility, Cranford, Tess of the D’Urbervilles, Pride and Prejudice, Crime and Punishment, Jane Eyre, and The Picture of Dorian Gray. The Hound of the Baskervilles, Oliver Twist, Emma, The Odyssey, The Woman in White, Treasure Island, The Sonnets and A Lover’s Complaint, Lady Chatterley’s Lover, Little Women, and Alice in Wonderland & Through the Looking Glass. 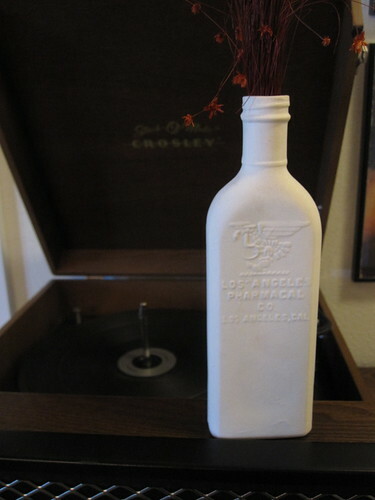 The talented Lisa Jones of Pigeon Toe Ceramics makes some of the most beautiful things I’ve ever seen. I have a love for anything that is the color white, traditional with a twist of modern, inventive, and/or one of a kind which is exactly how I would sum up her work. I would own everything she creates if I could! For you fellow Austin residents, Lisa’s work is sold here in town at one of my favorite places, Spartan. This particular piece is part of the “raw” collection featured by Pigeon Toe. It normally sits on the shelves in Mr. Fancy Pants and my apartment but for photography’s sake it’s sitting atop our record player. I do love how the raw, white ceramic contrasts with pretty much whatever I sit it in front of making it an eye-catching piece! Considering I have already posted about mine and Mr. Fancy Pant’s love, and by love I mean unhealthy obsession, with Frank here in Austin, it should be no surprise that we now have some of the artwork from the restaurant in our apartment! I’m pretty sure that I shared about the guys over at The Decoder Ring and the amazing artwork that they created that, in my opinion, completely makes the atmosphere and character of the place what it is. That said, during one of the 300 times that we have eaten there, I asked Mr. Fancy Pants if he thought we might be able to get a print of one of the posters for our apartment. It was almost too good to be true if you ask me. One of the awesome guys at The Decoder Ring hooked us up and this print now proudly hangs right in the entry way of our apartment. I love that it is the first thing that you see when you come in. Sadly, there is not a lot of space in the hallway and the lighting doesn’t do it justice, but one day this print will have a prime spot in the first house we own. Until then we’ll entice our friends to come over with the allure of a hot dog. What a beauty. The bike…not Mr. Fancy Pants. Just kidding. We like to refer to her as my “couch on wheels”. This cruiser is the most comfortable bike I’ve ever owned. Granted, there is not much competition in that category as I’ve only owned two bicycles in my entire life. Frankly, no pun towards the above mentioned hot dogs, I didn’t learn how to ride a bike until late in my childhood. I won’t disclose my actual age as it’s quite embarrassing but I will say that I learned before the age of 12 (a few months before…ha) I blame the whole anti-bike era of my life to a combination of being an only child with no one to ride with, Safety Camp at St. James Episcopal School where I was the ONLY child that still had training wheels (mortifying), and one really bad experience that I am sure my mind through the years has made a whole lot worse than it actually was. All I remember is being so hot and wanting to go inside, Mom yelling that I wasn’t going inside until I could ride by myself, really bad bike wreck that ended in a HUGE, Texas size pile of fire ants, and all I wanted was a dang popsicle. Love you Mom, I’m sure you were a great teacher, but for once in my life, I was not a good student. Needless to say, I’m I don’t have skillz on a bike so this cruiser is just right for me. These pictures are from one of my favorite days that Mr. Fancy Pants and I have had since we’ve been married. We put the money down for this bike last summer when I was still unemployed. We spent a good four weeks of the summer peddling around Hyde Park in Austin every afternoon. The pics are from the day she came in and we picked her up and the first time I had been on a bike in a LONG time. Good times. Can’t wait to ride her around this summer–boy can she turn some heads! At the bike shop getting ready for me to take her home! Hello blogging world! How I have missed working on my posts. I think I can be qualified as one of the world worst bloggers on account of my three month hiatus. That said, I have returned to my blog with a new attitude towards it. Thanks to my father as I blame him for my OCD personality (though he adamantly denies it, he’s far worse than I) which is what I attribute my failing blogging efforts to! Towards the end of last year, it had become overwhelming and strangely intimidating for me to try and post everyday which is what I felt that I needed to do to keep up. That’s the same reason that I can never stick with a diet plan or New Years resolution–it just overwhelms me somehow. However, I find that if I go into things like this with the right mindset it tends to turn out a little better. So I am pressing forward with my blog excited to share recipes, stories, things that I love, etc. as often as I can while making sure I am still enjoying it. Along with my return as Mrs. Fancy Pantz, I am moving forward with four other things in my life that will require an unusual amount of dedication and commitment from me–whether or not I’m willing or ready to put it forward. I am moving into a new position at work starting April 5, starting P90x on Monday to try and get myself ready for the summer, starting a Kaplan class to prepare for the GMAT for graduate school, and a New Years resolution that I didn’t commit to until March! Ha! The change of pace at work should be good, I’m dreading P90x but it needs to happen, and lets face it, no one wants to study and work full time, so I’ll fill everyone in on my New Years resolution because it’s the most exciting of the four! I love to read. It’s a favorite hobby of mine…probably my favorite. I’ve never had an organized or targeted approach to reading but that’s changing my friends. I have lists on napkins and scraps of paper in drawers all over the place with lists of books that I want to read. That said, my lists and the number of books that I own that I haven’t delved into yet far out number the ones that I have. The majority of what makes up my lists are classics that I either haven’t read and am definitely missing out because of it, or I was forced to read in high school or some college lit class and never fully appreciated it. A few weeks ago, I came across Random House Publishing’s list of The Top 100 Novels of All Time. Brilliance. I will be first working from the “Reader’s List” and when I complete that one I’ll move to the “Board’s List”. I’m excited to have a targeted approach to my reading and even more pumped that I’ll someday have read ALL of these timeless pieces of literature. I’m committing to read 50 this year but I’m hoping that I’ll finish more than that. The first one I read was #53 The Handmaid’s Tale by Margaret Atwood. My next read is #2 on the list The Fountainhead by Ayn Rand. Honestly this one has been a little tough to get into, however, I am pushing through! Resisting the urge to become too long winded, I am going to end my post here. I’ll be posting again soon though. Happy Sunday!